I have just bought the above appliance and intend to restore it back to its former glory! Does anyone have any photos of it when it was in service? Or does anyone know who I could ask? Added by James on 21 October 2007. Good luck with your project.Hope you don't mind the next cheeky question. I am looking at a similar vehicle to buy and wondered what the going rate would be for one in almost the same condition? Added by Paul Taylor on 27 October 2007. I have decided at last that I am going to start restoring this F8 to its former glory! Does anyone know how many F8's were made in total? Im also missing a few parts such as a radiator cap, locker hinges and suction hose etc...can any help? Also, do any of you know the history of this F8 or have any pics of her when she was in active service? Added by James Smith on 07 July 2008. Hi James, I have just read a magazine article about Dennis F8s which states 256 were made in total. I believe yours was one of three which served on the Isle of Man, the others being PMN 71 and 72 new in 1953. PMN 72 was converted into a FoT/HL and was still in existence in 1999. This is not first hand information but I believe it is accurate. With regard to spare parts, if only the Dennis scrapyard featured on this site was more conveniently situated!! Good luck with the restoration. Added by Chris Wood on 08 July 2008. I've just noticed this machine on you tube. Type in Dennis F8 and there are a couple of clips of it coming off a low loader and being started and moved for the first time in some years! I only hope that the owner or person with the video camera could provide us with an up to date clip on how she looks now. Added by MATT IRELAND on 09 October 2010. There is a book called from memory Mann Ablaze, it might be starting point. A letter to the local paper can be of use also a letter to OiC of the fire Station re retired members can be useful. Added by Neal Glover on 10 October 2010. 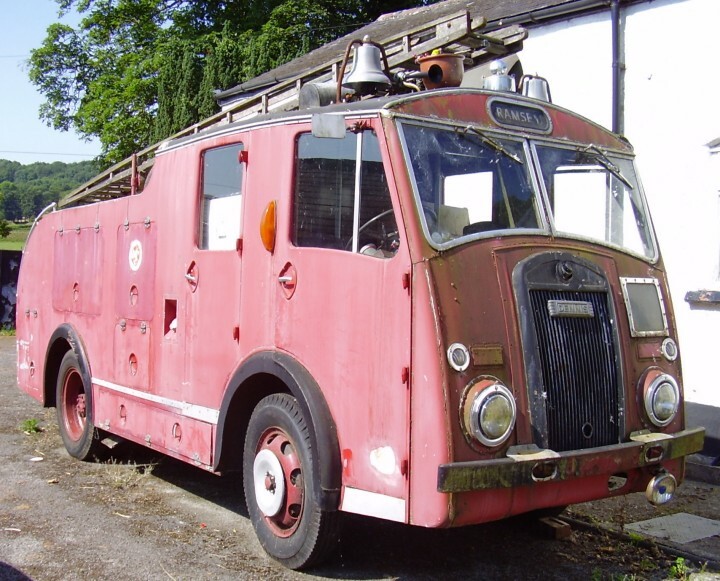 The book MANN ABLAZE, has recently been re-published, the book states this Dennis was at Ramsey. There is a black and white shot of it, plus a colour one showing 3 F8's, so presumably this is one of them. Added by Bristol Bob on 11 October 2010. I am the owner of the F8 and put the vids on youtube when I picked it up and then got it running. unfortunately I havent done anything with it since, well aprt from take the rotten roof off. Hope to do some more to it in the new year, will keep you posted! Added by James on 20 November 2010.